Winter has arrived in the US and after returning home to North Carolina from a fantastic but COLD 12 days in New York City I’m already longing for some warmth. Us Aussies aren’t built for long winters and our Christmas time is typically about summer activities and days on the beach! As for you North Americans who like to escape the cold for a week or two, I can’t help but suggest Hawaii as a great all-year-round destination. 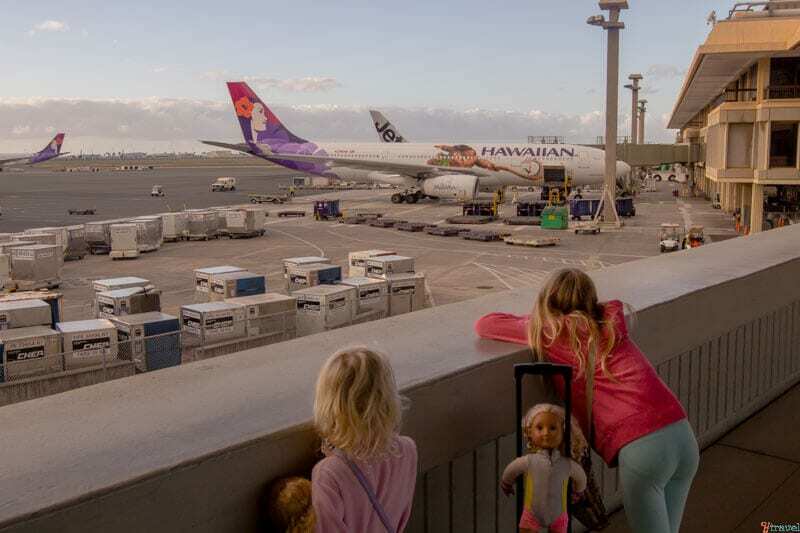 As you may know, in March we spent two weeks on a Hawaii family vacation during our move from Australia to the US visiting three of the Hawaiian Islands – Oahu, Maui, and the Big Island. We loved each island for different reasons. They all have their own unique personalities and down below are my tips on the best places to visit in Hawaii from our travels. Do You Need to Stay on the Beach in Hawaii? 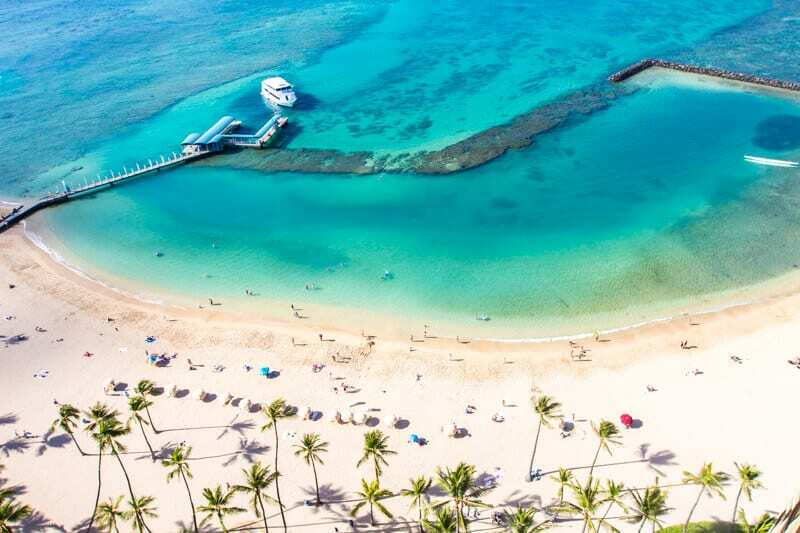 Oahu is the third largest of the Hawaiian Islands and offers a little bit of everything – relaxation, adventure, natural wonders and world-class dining and shopping. We spent 5 days exploring Oahu, and here are our top picks for things to do in Oahu. The Diamond Head walk is one of the most popular things to do in Waikiki, and for good reason. Just be ready to share it with hundreds of other visitors. But, if you’re an early riser, you will beat most of the crowds, so I suggest you get there for park opening at 6:30am. Otherwise if you get there mid-morning like us then the crowds can be intense! 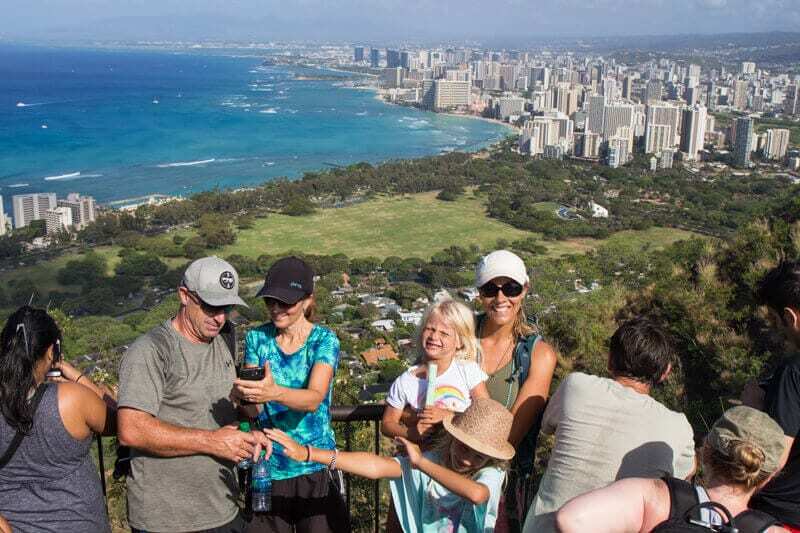 Either way, you are rewarded with extraordinary views over Waikiki Beach from the summit, and it’s a relatively easy climb for kids with lots of switchbacks. Plan on allowing at least 90-minutes to complete the circuit. To get to Diamond Head from Waikiki Beach, either drive if you have a rental car, or do what we did and catch the bus ($2.50 adults/$1.75 kids) to the bottom of the park entrance and then walk in from there. Park entrance fee is $1. Waikiki Beach needs little introduction. It’s one of the most famous and recognizable beaches in the world with Diamond Head and the Honolulu skyline as a backdrop. The main section of Waikiki is in front of The Royal Hawaiian Hotel (the Flamingo Pink) and does get crowded. It’s here where most of the outrigger boats operate from and learn to surf schools. 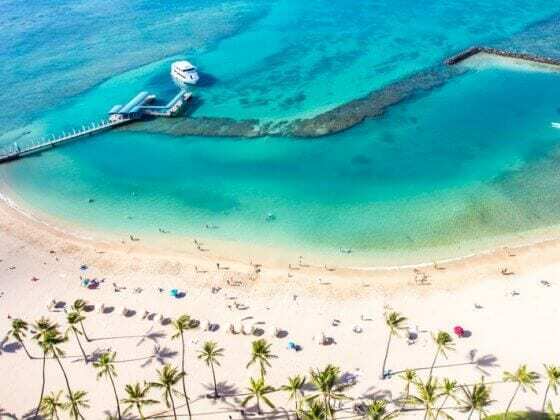 So if you’re visiting Hawaii with kids who want to learn how to surf, Waikiki is perfect – the waves are gentle and rolling and with clear waist deep water you’ll be standing up in no time. And if you actually get sick of the beach, you are right near the main shopping area of Waikiki along Kalakaua Ave. 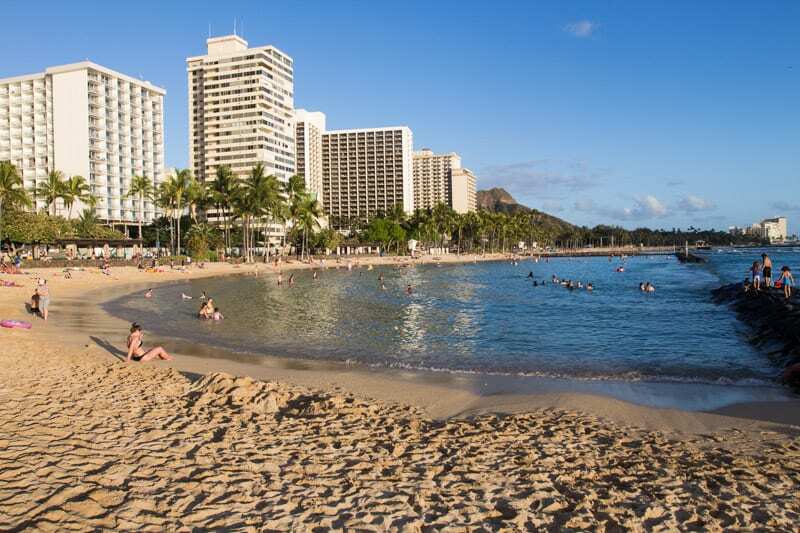 But if the thought of a city beach overly popular with tourists makes you weary, you can get away from most of the congestion, as Waikiki Beach is kind of split into three sections. 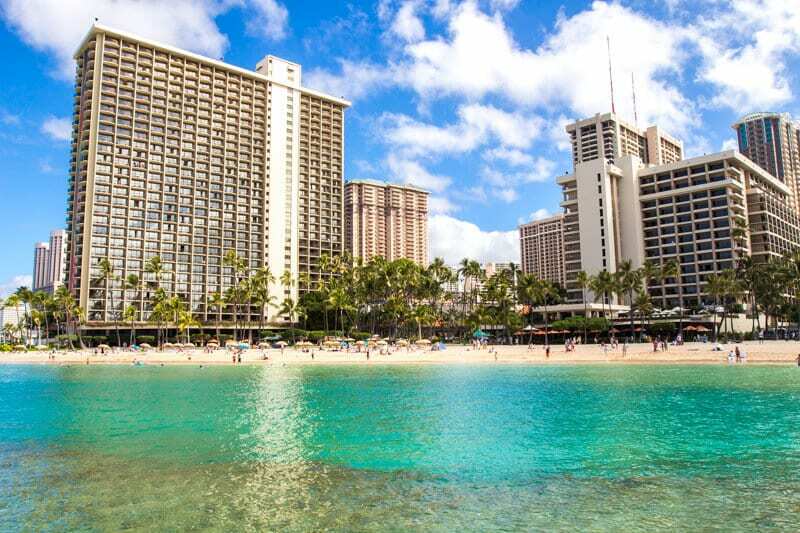 At the western end of Waikiki in front of the Hilton Hawaiian Village Resort you have Kahanamoku Beach. A curved section of beach with golden sand, palm trees, space for sunbathing, a reef for snorkeling, and that beautiful turquoise water. With a pier and break wall for protection, this is a lovely and calm section of beach for swimming with younger kids. Further east toward Diamond Head is the family-friendly Kuhio Beach. It’s out of the hustle and bustle of Waikiki and there’s a sea wall protecting swimmers from the force of the ocean’s waves – another perfect spot for young children to swim. And Kuhio Beach is quite pretty with the palm trees and offers a beautiful uninterrupted close up view of Diamond Head. No matter what section of Waikiki you visit, as a city tourist beach we were impressed, and the whole stretch of Waikiki from Kahanamoku to Kuhio is now one of my favorite city beaches in the world. No matter where you choose to lay your towel, a day on the beach is one of the best free things to do in Waikiki. One of the best places to go snorkeling in Oahu, and one of the most popular places to visit in Hawaii is Hanauma Bay Nature Preserve. This beautiful cove was once a volcanic crater and is now home to clear blue waters and lively reefs of colorful fish. Hanauma Bay is located 30-minutes east of Waikiki and we drove there in our rental car – you can take one of many guided tours on a shuttle bus. Open from 6am – 7pm (summer), 6am – 6pm (winter). Entrance fee is $7.50 per person (kids 12 & under are FREE). Masks, snorkels, and fins can be rented for $20. Get there early, around breakfast, as it gets CRAZY busy and there are only 300 parking spots. And if you wait too late the water gets churned up which affects visibility for snorkeling. 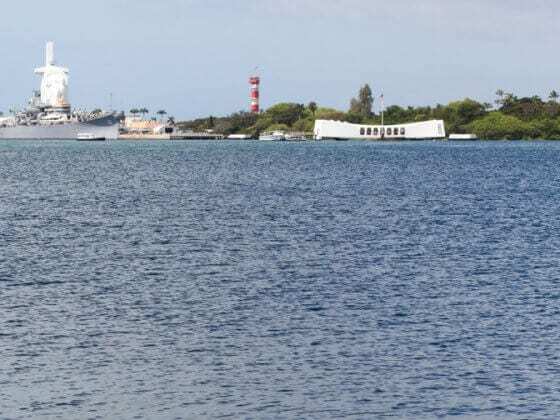 One of the most important and historical places to visit in Hawaii is Pearl Harbor. It’s a beautiful memorial, very moving and if you are foreigners like us offers new insights into US culture. And if you have kids, it’s a beneficial educational experience. 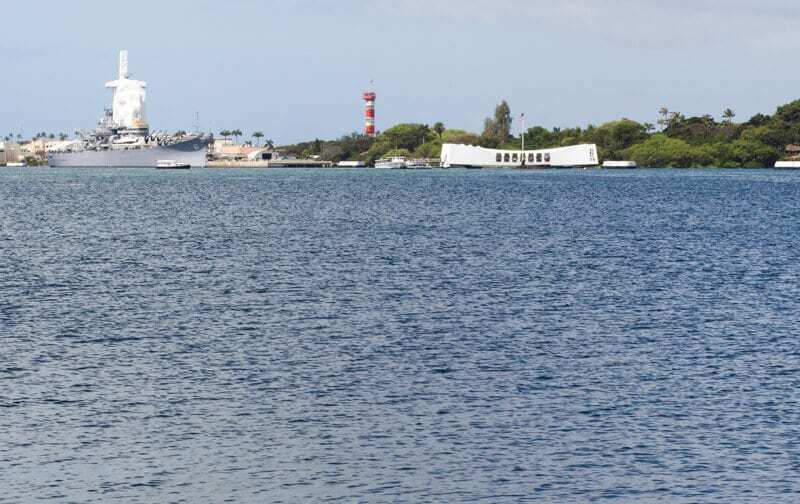 You can visit the grounds and museum before catching a boat over to the Arizona Memorial, the ship that sunk and is now the resting place of 1,102 of the 1,177 sailors and Marines killed. Seven decades later, oil still leaks from the fuel tanks of the sunken hull of the USS Arizona. Little drops of oil bubble up from the surface and dance across it. They are known as the black tears of the USS Arizona. If you are short on time, and without a car, you can join a half day or full day tour. Free tickets to the Arizona Memorial are released each morning at 7 am. Get there early and be prepared for long waits. But you may miss out on tickets! Otherwise you can get your skip the line tickets here. 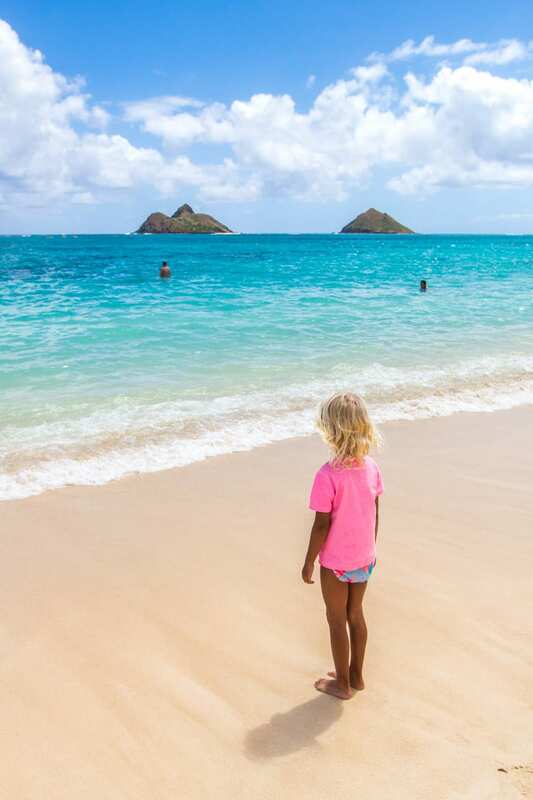 When you visit Lanikai Beach you’ll see why it’s consistently rated the best beach in Oahu. This strip of sand was our favorite spot on our road trip around Oahu and makes for a perfect place to stop and have a swim. Much quieter than Waikiki, or Hanauma Bay, and is a popular spot for kayaking and stand up paddle boarding. When you do a drive around Oahu to the North Shore, don’t miss Lanikai, we think it’s one of the best places to visit in Hawaii. Speaking of the North Shore, its claim to fame is big wave surfing with swell reaching up to 30 feet high, and experiencing this is one of the top things to do in Oahu. But big wave season is during the winter months (November – February is best), and considering we visited Hawaii in March we were a little too late. So it remains on our bucket list of things to do in Hawaii when we return! We still stopped in at the famous North Shore beaches including Sunset Beach, Pipeline, and Waimea Bay on our drive around Oahu which are still worth visiting in any season! And the coastal scenery is stunning! You could also rent one of these cool campervans from Outdoorsy. 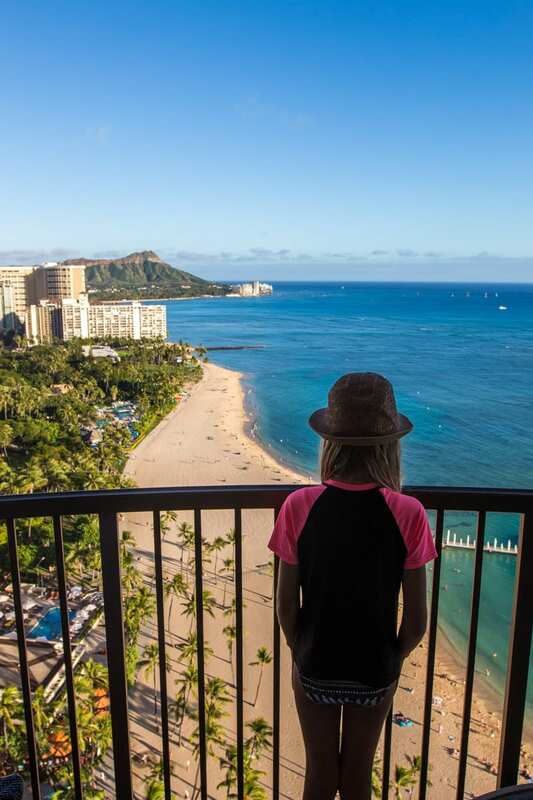 Even if you don’t stay at the Hilton Hawaiian Village, it’s a destination on its own. This is a huge property with 5 towers and a five-acre saltwater lagoon with all the water activities and toys to make for a great family-friendly place to play! The minute we walked into our room and saw the view from our balcony, we were wowed – probably the best hotel view we’ve ever had. And if you find yourself in Waikiki on a Friday night, don’t miss their fireworks show! Can you come to Hawaii and not see a Luau? Probably not! The Hilton Hawaiian Village is also home to the Starlight Luau. Initially we thought a Luau would be a bit kitsch and over-touristy, but we thoroughly enjoyed the dancing and music from the show which highlights the stories and culture from the different Polynesian islands. The spirit of the Hawaiian people really shines through, and a buffet dinner and a couple of free drinks never go astray – put it on your list of things to do on Oahu. The Big Island is about adventure, volcanic wonders, black sand beaches and wow moments. 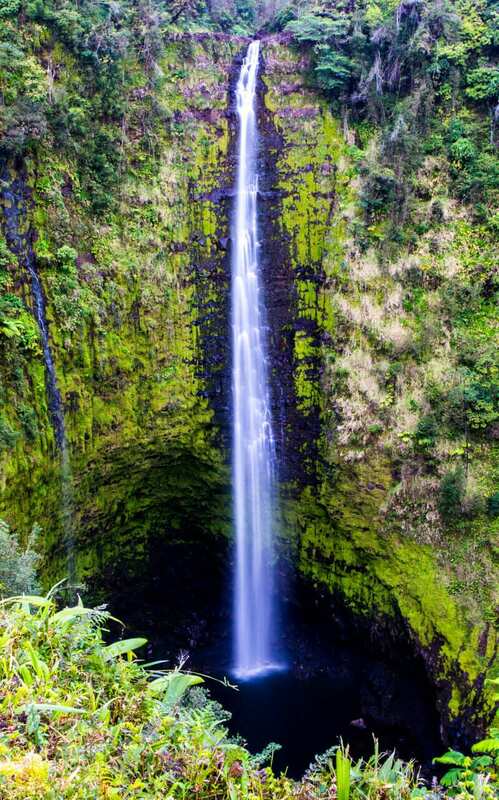 And it’s one of the best places to visit in Hawaii for waterfalls and full of awesome adventures for kids. Akaka Falls is Hawaii Island’s most famous waterfall and one of the most popular things to do on the Big Island of Hawaii. It plunges 442 feet into a stream-eroded gorge situated within the Akaka Falls State Park. There’s a loop walk here you can do and see the 100-foot Kahuna Falls – but it was closed for us during our visit, I believe due to storm damage. Don’t visit in the afternoon as the sun is in the worst position behind the falls making it difficult to see with your eyes, and terrible for taking photos – go in the early morning! Entry to the state park costs $5 per car or $1 per pedestrian. 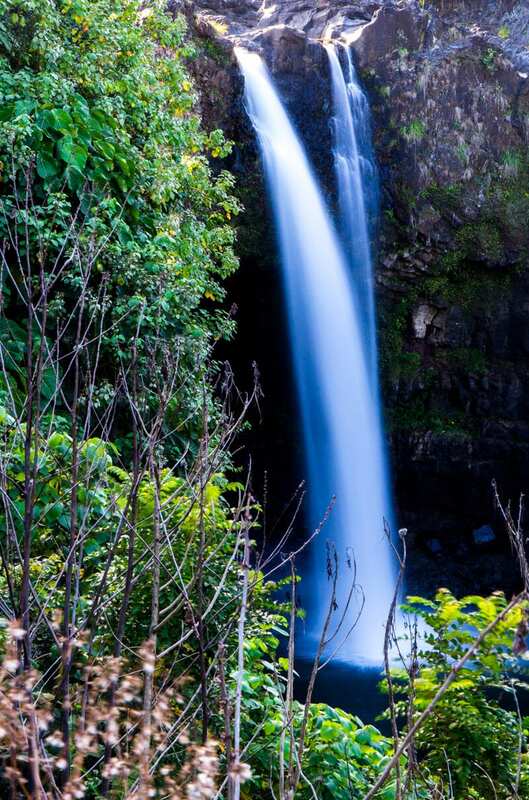 You can find your perfect hilo camper to tour around this area with Outdoorsy! One of our favorite places to visit in Hawaii was Volcanoes National Park. It was our first time witnessing an active volcano – Kīlauea – and probably the highlight of our visit to The Big Island of Hawaii. 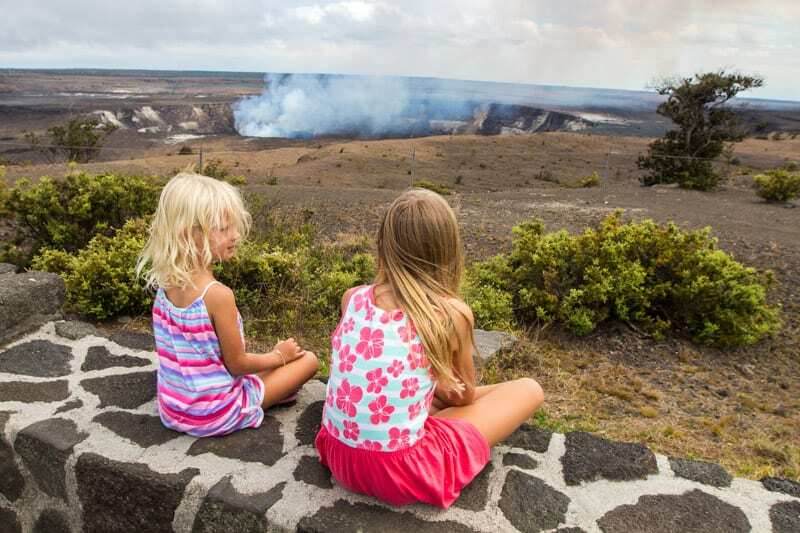 Start at the Visitors Center, then check out the Jaggar Museum and Overlook to learn more about volcanoes and to see the bubbling lava in the crater of the Kīlauea Volcano! There is a lava lake in the crater and when it fills up it bubbles over (amazing at night). Make sure you drive the Chain of Craters Road, an 18-mile spectacular drive that takes you from the visitors’ center to the coast where you can see lava still pouring into the ocean. On this drive pull off the road to view craters, see giant fields of lava rock and marveling at their texture and shape. Our only disappointment was that we could not walk close to the lava flow or see where the lava flows into the ocean. You can get closer with an 8-mile return hike, or on a boat tour, but apparently visibility at the time wasn’t good. So this hike goes on our bucket list of things to do on the Big Island of Hawaii for when we return! Costs: $25 per car, or $12 per person without a car to enter the park. 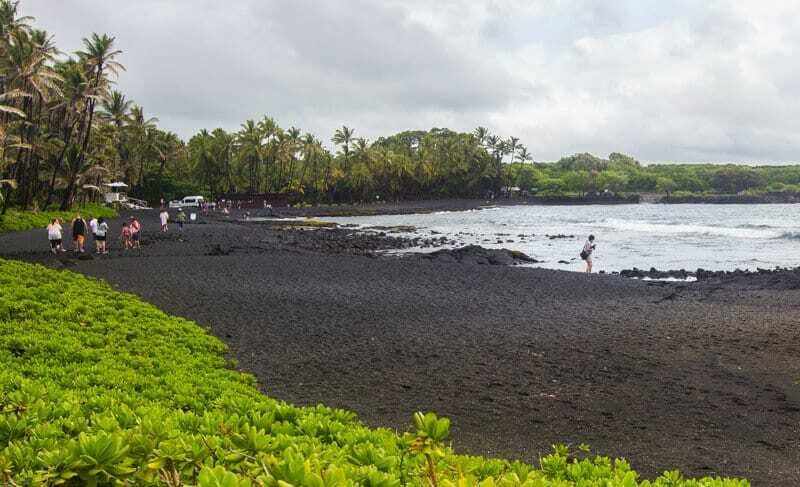 We got a lot of recommendations from our online community about the best things to do on the Big Island of Hawaii, and Black Sand Beach was one of them! For us it was one of the most unique places to visit in Hawaii. Not only is this beach so interesting due to its black sand, but Hawaiian Green Turtles like to visit here, and we were lucky enough to see one chilling on the sand at the water’s edge. We also continued our lessons on how volcanoes shape the land. The jet-black sand formed when molten lava from two nearby active volcanoes flowed into the water, cooled, and broke into fragments that washed ashore. Rainbow Falls is close to the center of Hilo town, and whilst smaller than Akaka Falls still a pretty sight. There’s a short trail from the parking lot that offers views from the waterfall’s summit. And if you time it right and get lucky you may see the reason for the fall’s name. On that same walk you’ll stroll through the exquisite forest (amazing trees). I loved Kona Town and the Kona coast. 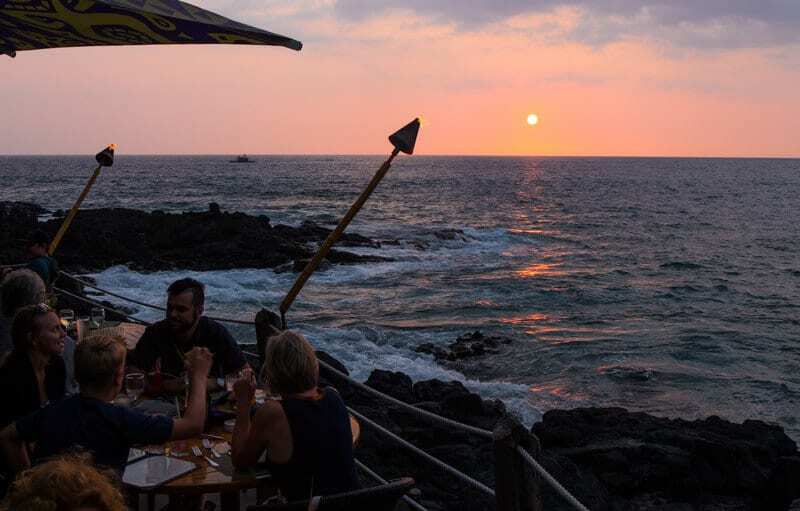 The town of Kona is really only one street that runs along the water’s edge, but it has a vibrant feel to it with plenty of cafes, bars and restaurants to choose from. Kona is quite a historical town as it once was the retreat for Hawaiian royalty and you can see some of the history reflected in the Hulihee Palace and the Mokuaikaua Church. Kona is also a great place for stand-up paddle boarding. Hire a SUP from King Kamehameha Hotel. Paddle out to the bay here and you just might be joined by dolphins. Don’t miss sunset drinks at Huggo’s on the Rocks, breakfast at Lava Java, and lunch at Daylight Mind Cafe. One of the most amazing things we have ever done on our travels anywhere was swim with the manta rays! At first we were apprehensive – swim in the ocean, in the dark, with manta rays and my five-year-old child! We set out on a traditional Hawaiian 40-foot double-hulled Hawaiian sailing canoe with the crew from Eka Canoes as the sun dipped below the horizon. Once out in the bay, we slipped into the water, held onto the side of a floating surfboard, and lowered our heads under the water with snorkeling masks on and torch lights. What happened next was incredible. Manta ray after manta ray swam around us, under us, somersaulting and brushing up against us – that’s how close we were to them! Don’t miss Keauhou – it’s one of the best places to go in Hawaii for a wildlife encounter! 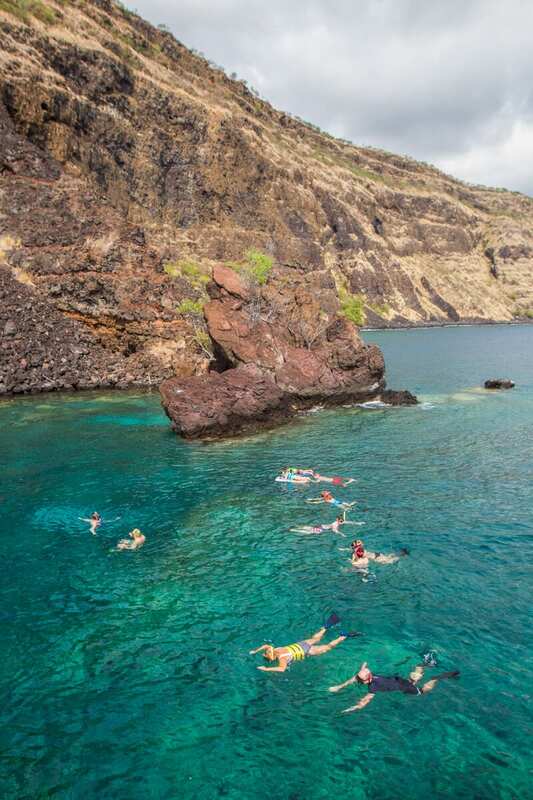 One of the best places to visit in Hawaii for snorkeling is Kealakekua Bay, 17 miles south of Kona. The bay is an underwater marine sanctuary and famous for its excellent snorkeling and kayaking, but also as the place where Captain Cook lost his life – being Australian it was one of the more noteworthy places to visit in Hawaii. On a snorkeling tour with Fair Wind Cruises we went zipping down water slides off the side of the boat or jumped off the top deck into a pristine marine bay filled with colorful fish and coral. 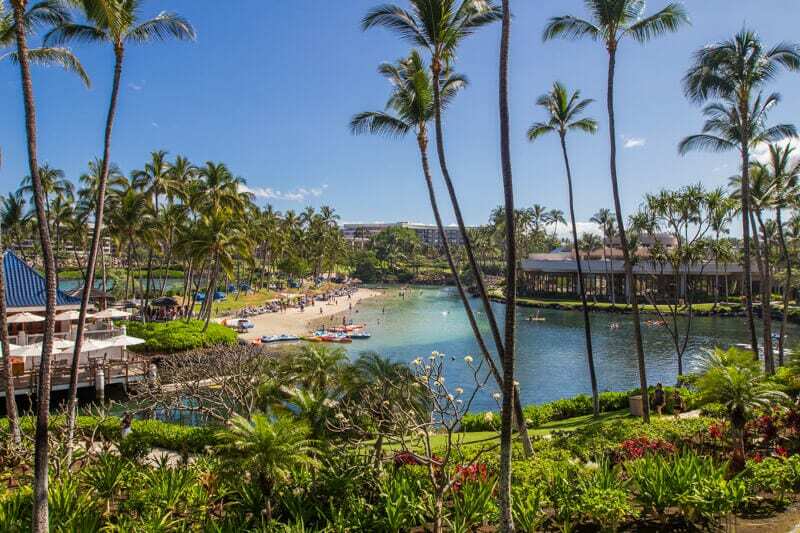 If the idea of a relaxing all-inclusive resort stay is more your style, then consider the Hilton Waikoloa Village Resort one of the best places to visit in Hawaii that has it all. Imagine 62 oceanfront acres, 3 swimming pools (including a 200 feet water slide) a saltwater lagoon, dolphin encounters, a full-service spa, and world-famous Golf Courses – this place is huge! Just head a little further north from Kona to Waikoloa Village and you’ll have everything you need. This goes on the list of relaxing things to do in Hawaii – our kids loved the pools and water slides! 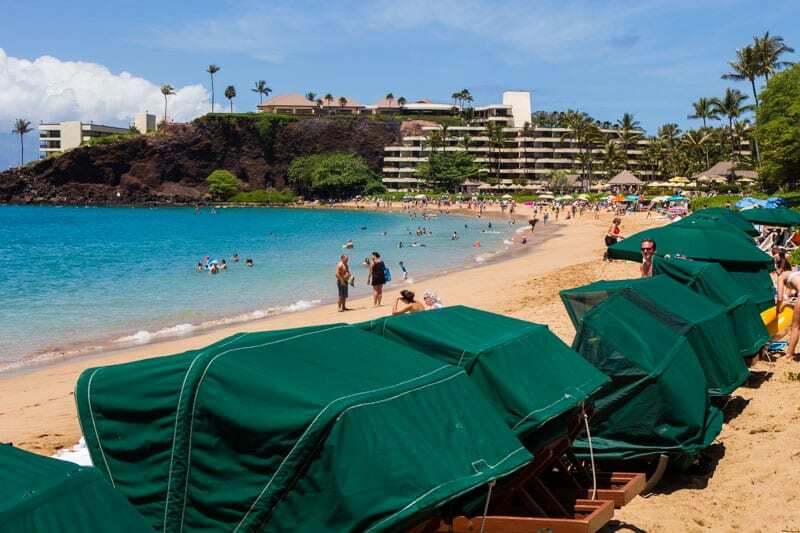 But our favorite thing to do whilst staying in Waikoloa was sunset drinks at the nearby Lava Lava Beach Club – get there early to grab a beach chair and enjoy the vibe and views. Maui is the second largest Hawaiian island and is the place for romance and relaxation, incredible sunsets and beautiful beaches, and the Haleakala Volcano. Not surprisingly, Maui has been voted “Best Island in the U.S.” on numerous occasions. 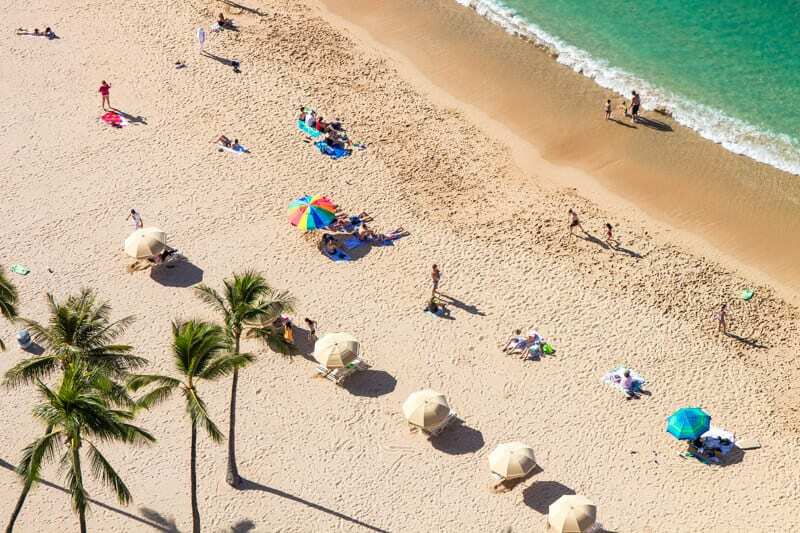 Once rated America’s best beach, Kaanapali Beach is three miles of white sand and clear water and out of all the places to visit in Hawaii, Kaanapali is the one place that most calls us to return to and soak up that Hawaiian sunshine. With the islands of Molokai and Lanai providing the backdrop, the views from your beach chair or stand up paddle board will have you longing for more too! We stayed for five nights at the Ka’anapali Beach Hotel (KBH Maui) which is known to be the most Hawaiian Hotel in Hawaii. You can rent SUP boards from the Kaanapali Beach Hotel for $25 an hour, and from here it’s an easy walk to all the restaurant and cafes lining the beach, including the open-air Whalers Village – a world-class shopping complex. At the northern end of Ka’anapali Beach is Black Rock Beach. 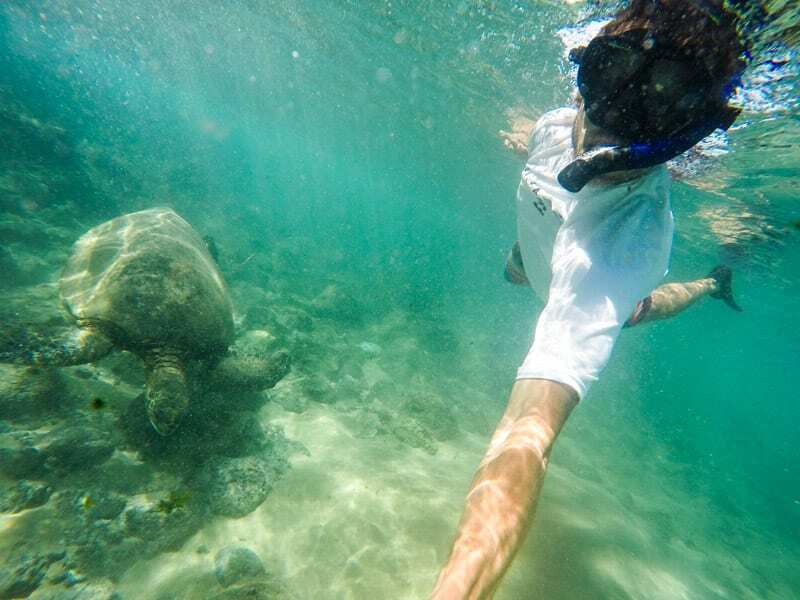 Black Rock is popular for two reasons; cliff diving and green sea turtles. This was one of the most amazing experiences we had in Hawaii. One giant turtle after giant turtle gracefully swam beside me unperturbed by my presence. And every evening a cliff diver lights the torches along the cliffs and then dives off in a re-enactment of a feat by Maui’s much-loved King Kahikili. Maui is also known for its spectacular sunsets. We recommend watching it from the Cliff Dive Bar located in the Sheraton Hotel. One of the most famous road trips in Hawaii is the 45-mile Road to Hana. With 617 hairpin curves and 56 one-lane bridges, you’ll need a bit of stamina for this drive, especially for the long winding road home (you do it in reverse). 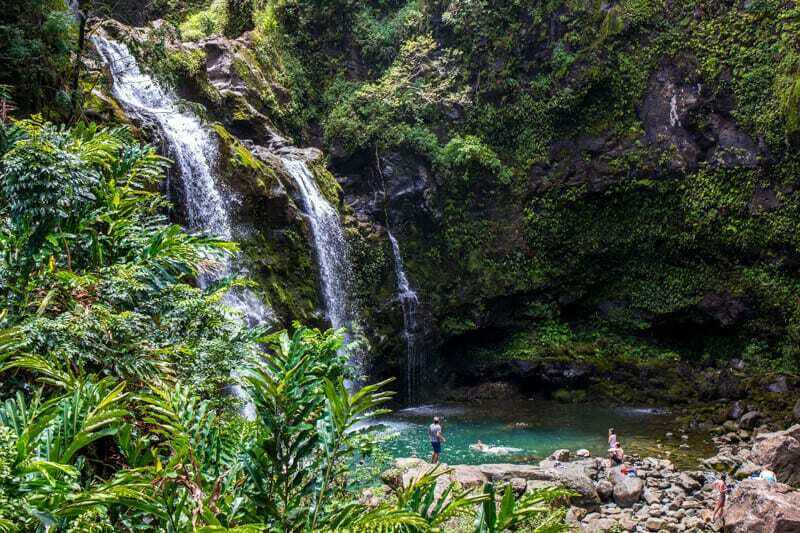 The road starts in Paia and is embedded on the side of the high jungle cliffs plunging into the sea revealing panoramic Pacific Ocean views, bamboo jungle and Norfolk pines, sacred waterfalls and swimming holes, lava tubes, tropical flowers and roadside food stands. Whilst this drive is famous and you must do it once, it fell short of our expectations given the exhausting length of the windy turns and because we have done so many great drives around the world we were a little under-awed. But, if a scenic jungle drive is something you have not done before, you’ll probably love it. Set aside a full-day for this drive and start early! Perhaps these groovy Maui campervan rentals would suit this Road to Hana drive. You can also find a popular jeep rental here. We actually preferred the gorgeous scenery on this short drive around the Ka’anapali coast than the Road to Hana – a lot shorter drive and nowhere near 617 curves! If you don’t have a full-day spare to drive The Road to Hana, this is a nice alternative. And it felt more rugged, and rolling hill green like in Ireland. The beaches along this part of the coast are pretty as well. 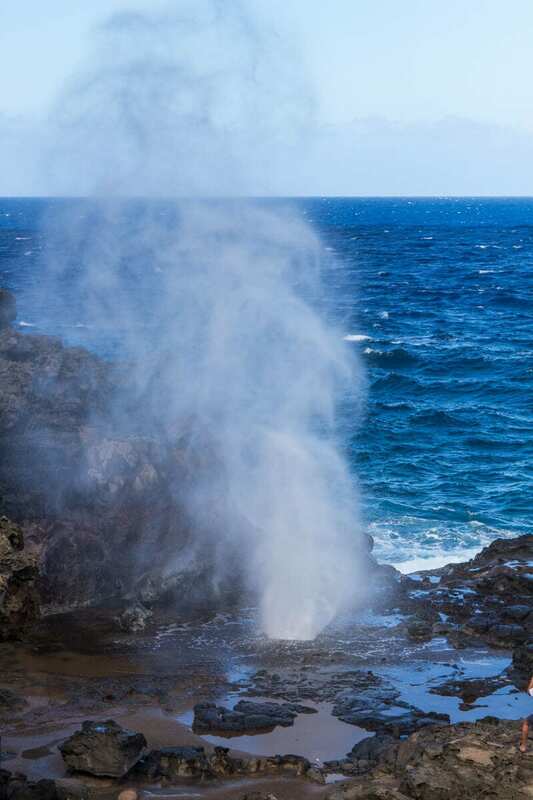 Nakalele Blowhole is a cool place to visit and can spurt water up to 100 feet high. We had an impromptu science lesson here with our kids talking about how blow holes work and watching it in action. During our little judging contest the blowhole managed to perform a 9. Excellent execution, form, and height. The area is pretty and you can walk around the rocks, but keep a safe distance from the blowhole. As for the weather, the saying goes that anytime is a good time to visit Hawaii. The average temperature is between 75˚ – 85˚ F (24˚- 29˚ C) with summer being a little warmer and drier, and winter a bit cooler – but nothing like mainland USA! What is the best time to travel to Hawaii? And keep in mind the major holiday periods in the US. Start searching for flights to Hawaii as early as possible. Airlines generally release tickets 11 months in advance, so once you know you’re taking a trip to Hawaii start searching and continue to check at least once per week. And be flexible with your flight dates! The best tactic for finding cheap flights is to search a couple of days, or even weeks, either side of your preferred departure date. Typically, flying on Tuesday, Wednesday, or Thursday can save you money. And flights that depart the US Mainland late and arrive in Hawaii in the evening, and the overnight (red-eye) return flights, tend to be much cheaper. If you can’t play around with the date of your flight, play around with the time of day you fly which can change the price dramatically. When staying in places like Waikiki you don’t need a car, so consider renting a car only for the day you want to explore, like we did on our North Shore road trip. This way you’ll save big bucks in overnight parking expenses (on average $25 per day). Most of Waikiki is walkable. Or you can get a cheap bus or trolley. Plus, when jumping on all-day tours they almost always come with hotel pickup/drop offs. And you don’t have to rent a car from the airport, as the major car companies like Avis, Hertz, Thrifty, Alamo, etc. have locations in Waikiki. But on The Big Island and Maui we had a rental car for the duration of our stay! Outdoorsy is the largest RV rental marketplace on the planet. They offer ease, flexibility and some unique and cool campervans for your Oahu road trip. Find your RV rentals for Hawaii here. Why not? These programs are free to join and you can earn points towards cheaper fares, upgrades, free companion tickets and even earning free flights! Frequent flyer programs mostly accrue by miles. So even if you don’t travel very often, taking just one long haul flight to Hawaii will add to your points balance. Just make sure your airline of choice flies to Hawaii! The further in advance you search for accommodation in Hawaii the more likely you are to get a cheaper rate. And just like with airlines, consider signing up for a hotel loyalty program. When comparing prices and places to stay, keep in mind that the dreaded resort fee is not included in advertised room rates. Resort fees can add $15 to $30 plus tax to your daily bill. And read the fine print to see what features the resort fee includes! Does it include free Wi-Fi, self-parking, bottled water, gym access etc.? Eating out in Hawaii three meals a day gets expensive real fast, especially for a family of 4 like ours, so consider getting a room with kitchen facilities. The room will be more expensive, but over a week or so you should recoup that money by at least making your own breakfast. Sometimes the best deals can come when you bundle i.e. when you combine flights + hotel. Or flights + hotel + rental car, etc. Booking a deal that includes some combination is usually most cost-effective for a family to travel to Hawaii. 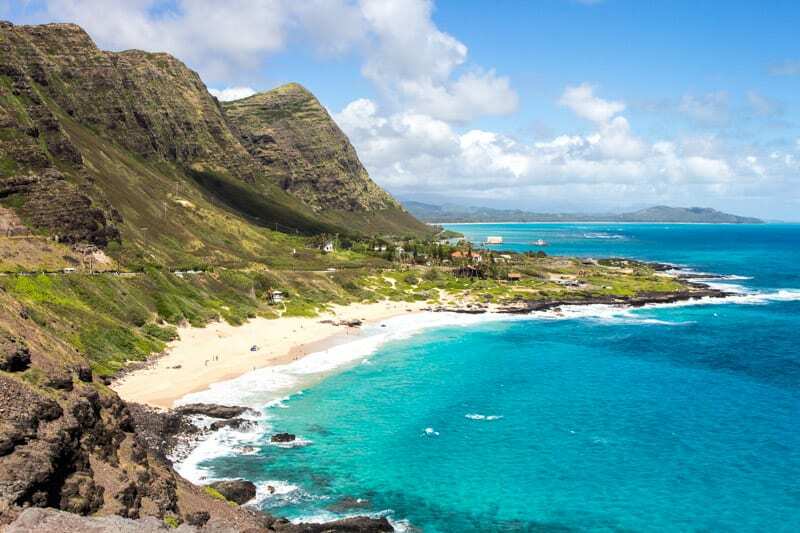 Major travel booking sites like Expedia make it easy to assemble Hawaii vacation packages from departure points all over the US and the world. And if you’re not loyal to one particular airline, they can help you comparison shop. To save more money, consider staying a block or two back from the beach. 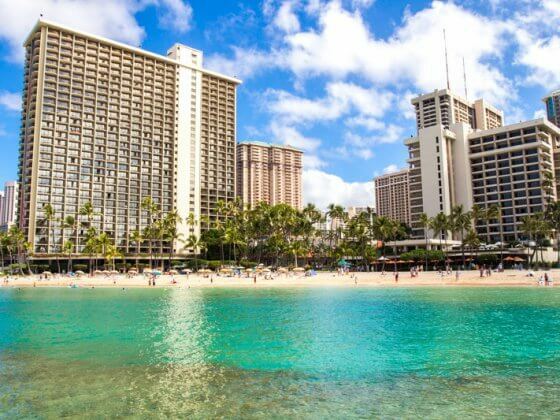 In Waikiki, one property we stayed at was the Hilton Garden Inn Waikiki which was an easy 5-minute walk to the beach, and reasonably priced compared to ocean front rooms. Sure, our ocean front room at the Hilton Hawaiian Village was amazing, just determine your priorities? 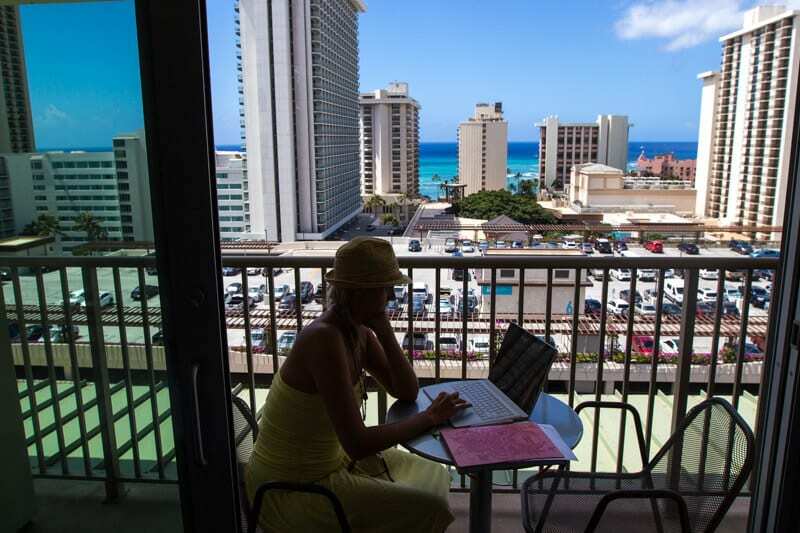 Hotels away from the beach are much cheaper in Hawaii. If you have a large traveling party, consider renting a vacation home that has at least two or three-bedrooms. Sometimes you can rent an entire home for half the price of getting several hotel rooms. Plus think of the savings of not always eating out at restaurants. Check airbnb rentals in Hawaii here. What do you think are some of the best places in Hawaii? Do you have any tips on things to do in Hawaii? Please share in the comments. Thank you so much for sharing this with us, it helps me a lot, really appreciated keep it up. Hope you make it to Hawaii. thanks for sharing with us this kind of information some of the places I still don’t know. Nakalele Blowhole is the amazing place I already visited one time in this place. many other places I want to soon visit, thanks again for sharing with us. I appreciate your effort. I must say that you have shared such a nice and informative article about Hawaii’s best places with all of us. All of these places are the best for travelling and tourists can enjoy some time with mates. I also explored these all fabulous places in my these tours and have a joyful time with my family and friends.